If you find yourself somewhat "vertically challenged", then this Cadet-length full set of clubs from the new alliance of Affinity/Orlimar is worth a look. Cadet clubs are designed for golfers 5'2" to 5'7" tall (as compared to Regular length for 5'8" - 5'11" and Tall for 6' and over). This set is part of Affinity/Orlimar's Advanced Technology package -- claiming distance off the tee from the oversized driver and fairway woods. 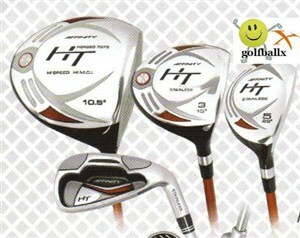 The driver is a large 460cc (forged) with 10.5 degrees of loft. Designed with a high MOI (Moment Of Inertia), the club features their "large profile face" technology. MOI is the ability of a club to resist twisting at the point of impact -- a very good quality to have in your driver in particular. The fairway woods are comprised of a 3-wood (at 15 degrees) and 5-wood (at 19 degrees) and, though smaller than the driver, tout the same performance technology. With two HT Hybrids (3-H and 4-H) designed to yield long, straight results, most golfers will find these hybrids far easier to hit than their long iron counterparts. All woods and hybrids are fitted with a regular flex, high-modulus graphite shaft. Rounding out the set are the HT Irons -- oversized and made in stainless steel, these were "inspired" by the very popular TaylorMade Burner Plus irons. The Affinity/Orlimar iron set has a large U-Cut cavity back and perimeter weighting -- both features that make it much easier to hit the ball higher and straighter, while still allowing some creativity and shot making. The entire set features 11 clubs: a driver, 3-wood and 5-wood, 3H and 4H hybrids, and the 5, 6, 7, 8, and 9 irons plus a pitching wedge. The woods and hybrids even come with head covers -- a nice touch. Orlimar is one of those "under the radar" club companies that, nonetheless, have a reputation for making solid, good performing equipment.